I hope everyone had a wonderful Thanksgiving. Mine was great–lots of good food and good company. I had been so excited to sign up for the Thankfully Reading weekend, hosted by Jen, Jenn and Beth, because I thought I would have tons of time to read over the weekend. I was kind of wrong, really. Friday I spent the day at my boyfriend’s parent’s home and then baby-sat for my best friend’s two kids later on that night. I managed to read one book that day–Tomorrow, When the War Began, by John Marden. If you enjoy YA dystopic lit, this one is a good choice. I loved it! Yesterday my boyfriend and I went to cut down our Christmas tree with my family. Then we had friends over. I did manage to read My Darling, My Hamburger, by Paul Zindel, but only because it was a very quick read! Today I will be reading A Separate Country, by Robert Hicks. I have most of the day set aside for reading but I doubt I will be able to read the whole thing today. We will see. So far though, it has really caught my interest. I also read The Jade Cat, by Suzanne Brogger this week. The first portion of the book is phenomenal! The rest of the book lagged a bit for me but still, it is a worthy read! 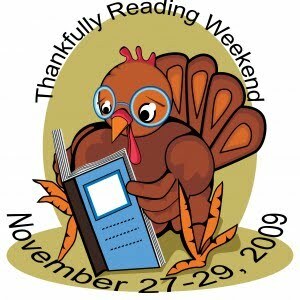 Have you been participating in Thankfully Reading weekend? If so, how are you doing? My week was pretty uneventful. I did manage to get a good amount of reading done. I read three books, one of which I reviewed already. I am now reading Sylvia’s Lovers, by Elizabeth Gaskell for the Classics Circuit. I am very excited because I have wanted to read Elizabeth Gaskell for awhile now and now I have a motivator! To be honest, I had never heard of Sylvia’s Lovers–it was assigned to me randomly, and I am guessing it will probably take me all week to finish because it looks quite long and dense. I now need to decide what to read for the Edith Wharton circuit. I have read four of her books but I want to read something new of hers (I am not a re-reader for the most part). I was thinking Ethan Frome but there may be too many people choosing it. We’ll see. And lastly, I want to highlight a new reading event. It is being hosted by Jenn, Jen and Beth and it is called Thankfully Reading. You can find all the details at the book blog social club, but basically it is a low key reading event for the long weekend after Thanksgiving. Jenn had mentioned on twitter that she planned to read a lot during the weekend after Thanksgiving and the idea just kind of blossomed from there. My boyfriend will be out of town that weekend. Saturday morning I plan on going with my family to get Christmas trees, but other than that I will have plenty of time to read. So count me in! I will be keeping it VERY lowkey. No expectations, just very relaxed. Or that’s the idea anyway! So now off to do chores and get into Sylvia’s Lovers. What are your plans for today?